In its first year, 2017, the Trump administration devoted top priority in Asia to pressing North Korea to halt its development of nuclear weapons. This effort involved unprecedented U.S. pressure on China to get North Korea to denuclearize. Beijing accommodated the United States and applied much more pressure than in the past on North Korea. 2017 also saw President Donald Trump make China a centerpiece of his personal efforts to build friendships with Asian leaders in summit meetings in Washington and the Trump Mar-a-Lago resort in Florida and during the president’s lengthy trip to Asia in November. Trump’s early acceptance of a phone call from Taiwan’s president was not repeated. Meanwhile, the administration approved a large sale of arms to Taiwan and conducted freedom of navigation naval exercises in Chinese-controlled disputed areas of the South China Sea. Negotiations on the big U.S.-China differences on trade ultimately failed. For its part, Congress remained preoccupied with failed efforts to end the Obama administration’s health care program and a successful push to implement a tax cut plan. The Trump government’s National Security Strategy of December 2017 and its National Defense Strategy of January 2018 employed harsh words about China as a predatory rival. In these documents, China was the top danger to U.S. national security. Added to China’s military power and assertive actions in the Asia-Pacific was the danger China posed to the United States if it carried out its plan to be the leading country in various high-technology industries seen as essential for sustaining U.S. international leadership and national security. In communications with Congress, administration leaders repeatedly highlighted the latter danger, which represented a newly prominent and important issue in 2018 added to longstanding American grievances against China. 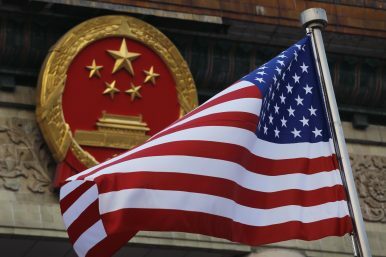 U.S. Trade Representative Robert Lighthizer issued a dire warning against the many covert and overt ways China unfairly took advantage of the United States. He said such practices represented “an existential threat” to the United States. Meanwhile, FBI Director Christopher Wray highlighted for Congress another newly prominent issue: Chinese overt and covert influence operations, including espionage in the United States. He warned repeatedly that America needed a “whole of society” effort to counter Beijing’s perceived nefarious intentions. Congressional members of both parties saw the wisdom in the administration’s warnings and began to take action, making 2018 the most assertive period of congressional work on China since the tumultuous decade after the Tiananmen crackdown. However, the broader impact on American politics was diluted. For one thing, public opinion generally was unaware of China danger — it stuck to its longstanding view of not liking the Chinese government, but also seeking to avoid trouble with China. At the same time, media remained largely unaware of the major shift. They tended to focus on Trump’s antics, and his seeking trade protectionism for his “base” supporters. Trump himself did not use the anti-China language seen in the administration’s strategy. And he repeatedly expressed friendship and respect for Chinese President Xi Jinping, whose support he continued to need in dealing with North Korea. Against this background, Trump disapproved of forward U.S. movement with Taiwan as he attempted negotiations with North Korea’s Kim Jong Un. In addition, senior administration officials remained divided on how to approach economic issues with China. Gary Cohn’s departure from the White House staff in March 2018 proved a tipping point, as it weakened the moderates. Initial punitive tariffs ensued; China retaliated. Yet throughout this process, China remained sanguine and was late to recognize the emerging serious confrontation with the U.S. government. Starting in the late summer of 2018, the United States has embraced a whole of government strategy to address challenges posed by China. Congress is in the lead, using legislation, hearings, and statements targeting Chinese practices. The most important foreign policy legislation of the year, the National Defense Authorization Act, passed and was signed into law in August. On China, it stresses “whole of government” American counter-efforts; hits China hard on influence operations and the high-technology industrial threat to the United States; and also attacks China regarding the South China Sea and Taiwan. The law echoes those administration leaders viewing China as the primary threat. The tone of the legislation and discourse by leaders in the administration and on Capitol Hill shows a new urgency. China is now viewed as a peer competitor undertaking predatory actions against U.S. interests. Without U.S. countermeasures, China is now seen as likely to dominate high technology industries essential to U.S. economic leadership and overall national security. Around this same time, punitive tariffs against China begin to pile up. In June, Trump announced 25 percent tariffs on $50 billion worth of Chinese goods. In July, the administration threatened to place 10 percent tariffs on another $200 billion of Chinese imports; in August that rate was increased to 25 percent. By September, tariffs on $267 billion worth of other China imports were being considered. China responded with tariffs on almost all of the much smaller amount of U.S. exports to China. Throughout the fall, administration officials continued to turn up the rhetorical heat on China. Trump, in the world spotlight at the UN General Assembly, condemned China for influence operations seeking to undermine the Republican Party in U.S. midterm elections. Notably, previous Trump criticisms of China had focused on trade, with some suspicion of Chinese weakened sanctions against North Korea. Secretary of State Mike Pompeo also echoed a tough line against China in a U.S. media interview. On October 4, Vice President Mike Pence laid out the administration’s case against China’s whole of government efforts against the United States, promising protracted U.S. counterefforts. That was followed by a series of actions that, when taken as a whole, represent a notable shift in the U.S. approach to China. The U.S. implemented unprecedented public sanctions directed against a Chinese company and company officials for buying weapons from Russia. In another first, the FBI undertook a sting operation in cooperation with Belgium to arrest a Chinese Ministry of Public Security official in Belgium. The official has been extradited to the United States for prosecution on charge of economic espionage. Senior U.S. leaders have also taken a hard line on condemning China’s Belt Road Initiative (BRI). The United States has placed unprecedented pressure on El Salvador and two other Western Hemisphere countries for breaking ties with Taiwan and giving greater entry for Beijing. The U.S. also opposed an IMF bailout of Pakistan that would be used in part to repay China loans. Earlier, the Trump government indicated it opposes the World Bank lending $2 billion a year to China. The Trump government also announced plans to withdraw from the INF treaty. The move, while ostensibly aimed at Russia, will allow the United States to develop a conventional ballistic missile threat to China, countering China’s current ballistic missile advantage and compelling very expensive Chinese ballistic missile defenses. After visiting Russian President Vladimir Putin in Moscow, Bolton said the United States wants to have strategic talks with Russia regarding China. Media reports disclosed U.S. efforts with allies and partners to share intelligence and related information with a focus on countering Chinese influence operations and acquisition of foreign high technology. There is now a growing pattern of strong restrictions by these countries against China’s technology acquisition. The United States is also seeking cooperation from abroad on countering Chinese trade practices. Following tough U.S. pressure leading to (re)negotiations on bilateral trade agreements more beneficial to the U.S. with allies and partners in Canada, Mexico, South Korea, Japan, and Europe, the Trump administration is finding support among these states for closer cooperation targeting their large common concerns over China’s predatory practices. The bilateral phase, while offensive to the allied governments, appears not to have dissuaded the partners from working with the United States against China. In August, Pompeo promised U.S. security assistance to Asia worth $300 million and a “down payment” of $133 million for economic efforts to mobilize the private sector in the region. More significant was the passage of the BUILD Act in October, committing $60 billion in U.S. investment financing for projects abroad, widely seen as in direct competition with China’s BRI. Meanwhile, Japan, Australia, and India have joined with the U.S. efforts or have parallel measures of their own that work against China’s BRI ambitions. Finally, with increased funding from Congress, the U.S. defense buildup vis-à-vis China continues, with more frequent freedom of navigation B-52 bomber flights and naval operations, notably in the disputed South China Sea. China then sent a warship to confront a U.S. destroyer conducting a freedom of navigation operation in Chinese-claimed waters in October, resulting in a near collision. In unprecedented behavior since the normalization of US-China relations four decades ago, the U.S. government has publicized the transit of U.S. warships in the Taiwan Strait, with a two ship transit reported in the weeks after the near collision in the South China Sea. Allies Australia, Japan, France, and Great Britain joined the United States in supporting the 2016 UNCLOS tribunal verdict against China’s South China Sea claims and in carrying out naval activities in the region that China opposes. The Trump administration’s new hard line toward China has momentum and wide support in Congress; the issues prevalent in 2018 easily could be joined by other issues reflecting negatively on China. Those other issues include Xi’s close collaboration with Putin, which paints China as a predatory opponent of the United States. Critics of the hardline Trump policy who worked for previous U.S. governments and favored accommodation of China for sake of stable relations and the benefits of engagement remain on the defensive. They are often discredited by those now in charge because of their perceived negligence while in power. In the recent past, U.S. government stakeholders could argue in interagency discussions that tough U.S. measures against China risk retaliation against their agency programs with China. The atrophy of various U.S. government engagements with China scuttled those criticisms, as those programs have declined. Beijing, meanwhile, remains loathe to compromise. The Chinese government continues to depict strongman leader Xi Jinping as setting the agenda for international affairs, not giving way to foreign pressure. Nonetheless, considerable uncertainty remains about the continuity of current U.S. policy. For one thing, the avowedly unpredictable Donald Trump may make a compromise deal with China that helps his “friend” Xi Jinping. More generally, the costs of dealing with Chinese retaliation could be very high. Costs of carrying out the planned broad hardening of U.S. defense, internal security, and economic operations against China could also be formidable. Tariffs and turmoil to U.S. consumers, businesses, and stockholders will start to add up soon; public opinion and the media may respond negatively. Asian partners and allies also have consumers, businesses, and stockholders impacted by U.S.-China tensions, making their support for Trump government pressure on China less than uniform. The possibility of China resorting to the use of force against U.S. pressure or heavy Chinese coercion on Asian neighbors could cause them to hedge against U.S. policy. The predicted rise in U.S.-China tensions may lead to armed confrontation and conflict. Preventing escalation may be harder to do in an atmosphere of suspicion and mistrust. Robert Sutter is Professor of Practice of International Affairs at George Washington University.